Scotland hung on to defeat Nepal by three runs in their opening World Cricket League Championship encounter. Rain delayed the start of the match in Ayr until the afternoon and the one-day international was reduced to 36 overs per innings. 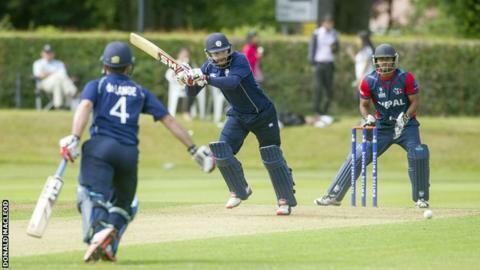 Captain Preston Mommsen posted 78 runs from 62 balls as Scotland built up a total of 235-7. And although Anil Mandal reached a century, the visitors fell short on 232-5. George Munsey and former skipper Kyle Coetzer got Scotland's innings under way after Nepal elected to field. Munsey was caught out by a diving catch for 19 before Matthew Cross (20) went lbw. Coetzer was eventually caught out for 41 but Mommsen reinvigorated the Scots' total with four sixes. Con de Lange then hit an unbeaten 55 - his first half-century for Scotland. Mandal reached his 100 before Richie Berrington took one of his three catches for the day, while Paras Khadka impressed with 70 off 55 balls during the Nepal innings. Gavin Main was the pick of the Scottish bowlers taking two wickets in his seven overs.